"Without revolutionary theory, there can be no revolutionary movement"
On Thursday 31st October, University Staff from the UCU, Unison and Unite trade unions took part in a joint strike action against a prolonged assault on their wages that has seen them lose 13% in real terms since 2008. Staff ranging from academics to cleaners joined the picket lines to fight for the decent pay and conditions they deserve. 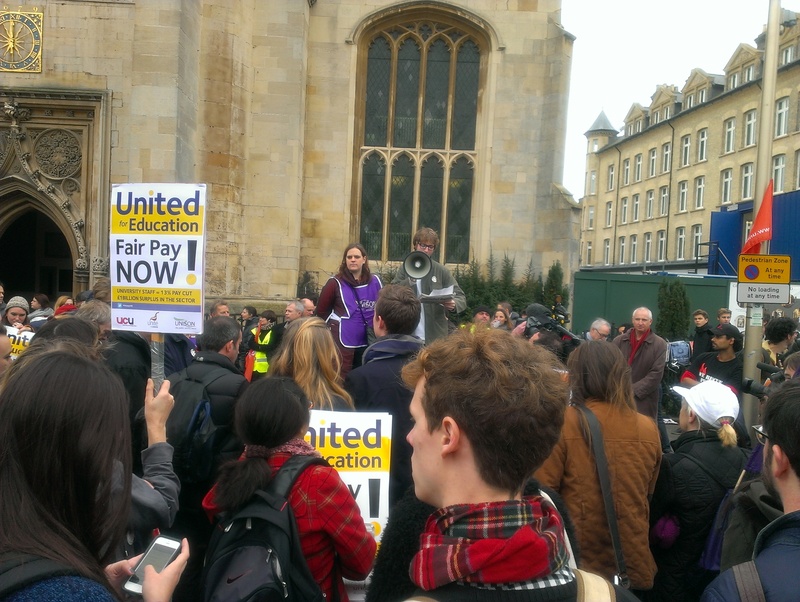 All over the country, they were joined by students, who – rather than grump about a day’s missed lectures – were proud to stand in solidarity on the picket lines. 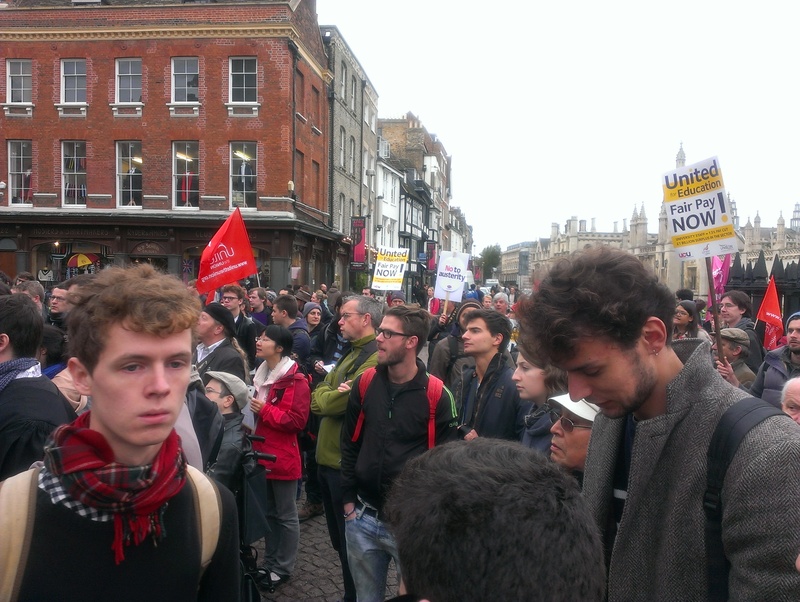 The Marxist Student Federation mobilised its membership to join the strikes across the whole of Britain. 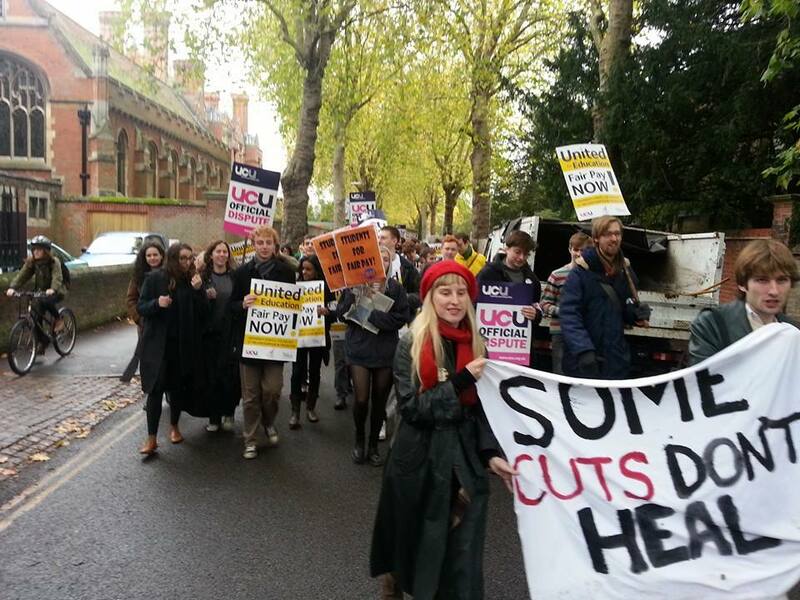 MSF members were on picket lines at almost 15 Universities around the country. From Sussex to Sheffield, from Edinburgh to Newcastle, and from as far afield as London, Glasgow and Aberystwyth, you could find revolutionary students delivering a socialist perspective – along with some tea and biscuits – to the striking workforce. Chosen to organise the picket delegation was MSF member Mordecai Paechter. Over the course of the day, the MSF – on behalf of CUSU – organised a large number of students, a majority of whom are MSF members, to go down and show our support on the picket lines. This was a fantastic opportunity not only to present our ideas to those on strike, but also to flex our organisational muscles. MSF member Ben Platt, whom we interviewed on the picket line, had joined the strikes ‘to show solidarity with striking lecturers and all university staff, who are not getting the pay they deserve and need to be paid more in recognition for their hard work educating us.’ He called for all workers to receive ‘fairer pay, pay that rises in line with inflation so that at the very least they should not suffer a real terms wage cut’. This sentiment seemed to be shared throughout the crowd gathering at the Sidgwick Site picket line. Mordecai – responsible for organising the CUSU delegation – was also appointed alongside Arsalan Ghani, another MSF member, to speak as CUSU representatives at the joint-union rally at midday. Whilst Arsalan focused on other scandals at the university, such as the renting out of student accommodation to non-students by many colleges, and the arms-trade investments of Trinity College, Mordecai brought a message of solidarity from CUSU, linking the struggles of the university staff to other Education cuts and wider austerity. It is also crucial to stress the wider context of these events. The pay and conditions of university staff are being slashed as part of a wider attack on education in Britain that has seen cuts to courses, an increase in tuition fees and the introduction of free schools. The struggle by staff for decent pay therefore concerns students as much as the fight for free and decent education. But the context is wider still – this attack on education cannot be separated from similar attacks on the NHS, the unemployed, the disabled, the welfare state, the emergency services, and other publicly funded institutions. The struggle against cuts to these services therefore concerns students as much as the fight for free and decent education. The fact is, that there is enough money in Britain, not only to avoid these attacks, but in fact to greatly increase public funding for education, healthcare and the welfare state. This money – amounting to £750bn – is currently privately owned and remains uninvested, not because it is not needed, but because it cannot be used to profit the handful of people who control it. This was very well received by the crowd, indicating the tremendous echo that Marxist ideas now have amongst the labour movement. By far the greatest cheers, however, came after Mordecai called explicitly for socialism: “The capitalist system inevitably results in crises, inefficiency and the exponential growth of inequality”, he said. “The solution for this crisis can only be socialism.” As one indicator of the popularity of this message, Socialist Appeal Cambridge sold almost its entire stock of papers in the immediate aftermath of this speech. It would be really fair if we redistributed a little bit of it to reflect the hard work that’s done on some of the lower levels – not just by lecturers and PHD students, but by the support staff that keep these institutions running. Cleaners, kitchen staff, admin – none of us could do anything without them, and more than half of them are paid less than the living wage. It was wonderful to hear such firm solidarity between working people across the pay levels. The real fruit of their battles lies, not in the immediate result, but in the ever expanding union of the workers. (Marx, Communist Manifesto). We can add ‘students’ to that too. This is an ideal group for anyone in Cambridge who wants to discuss Marxist theory and its application to modern events. The group organises debates, discussions, talks, film showings, and reading groups based around the works of Karl Marx and other related thinkers, along with events that address current affairs and campaigns from a Marxist perspective.